My name is Paulina and I live with my partner Luis. We are a responsible professional couple with a passion for pets. We decided to babysit and offer that service as we can appreciate how hard it's find someone trustworthy and not too expensive in London. Between us two we have lots of experience caring for different kinds of pets, birds, rats, rabbits & guinea pigs. Available on request only on special circumstances, price depends on the distance, please note that we don't have car and will be using public transport. Available on request only in special circumstances,price depends on the distance, please note that we don't have car and will be using public transport. Luna Charlie Tedy Lily Amber &amp; Argo Gandalf on the move :) Puff &amp; Munch Smarty Ted Blue and sunshine With Samy Samy Daisy Sherlock June Scampi &amp; Fuzzy Woofi Choochee Pedro Breakfast :) Mifi Charlie Monkey monkey Honey, monkey monkey &amp; cloudy With Pon Pon Charlie Monkey monkey &amp; Cloudy Our smallest resident Henry Luna Whofie Bibi Rascal Pipi Our biggest resident Choochee :) Our smallest resident Henry Charlie Chichilas Mr Sleepy Sherlock Our biggest resident Choochee :) Lipstick Miss Jessica Paulina &amp;amp; Luis One of our first rabbit guest lovely Blueberry One of our first rats guest Our first rats guest- you can't not live them Our flat, living room Our back yard garden, private access only for residents. Our back yard garden, private access only for residents. Paulina looked after my ferret when I was on my holiday. I received pictures every day and I could tell my pet was in good hands when I was away. I will definitely use her service on next occasion. Highly recommended! Thank you Paulina! I was very nervous to leave my dog but Paulina and Luis turned out to be absolutely amazing! They were so welcoming and took a great care of Sara. She came back home happy and normal and that I think if the best they could do! I was lucky to find Paulina days before my planned departure and I am so happy I did! She took great care of my Russian dwarf hamster - Cins, and sent picture of her for me not to worry. I also provided fresh veg for Cins every day and genenerally took lovely care. I would definitely say if you are looking for someone to take care of your hammie (and you also a very worrying person, like me) Paulinaâ€™s boarding is the place to go. Paulina took such good care of our little bun and sent lots of whatsapp pictures and updates which was fantastic. Would highly reccomend and will definitely be going back! I did not feel as comfortable as most of the people in these reviews. The main thing was the lack of communication. I was so nervous leaving our bunny as he normally has free run of the house but here he was kept in stacked cages in the boarders bathroom. I had a slight freak out when I saw their little boy tip a bottle of bubbles into 2 guinea pig's cage at drop off, but my partner convinced me he would be ok. Our bunny was here for 11 days and we only had 2 updates when asked. When we went to pick him up he was ready at the door and passed through with his stuff. No conversation of how he had been etc. It seemed as though he hadn't had much time out of a cage because when we got him home he was nervous and not himself at all. This has never happened after staying with family. I'm sure this place is fine if you're happy to drop and go with a quick pick up but personally our bunny (but also us!) needed more than that. Paulina just took care of our two guinea pigs in an excellent way: we were able to use her cage to make traveling easier and she sent us pictures to keep us updated throughout our trip. We really felt our small animals were in great hands!! Paulina took great care of our bunnies whilst we were away for Christmas. We had never left them with anyone before but she made us feel completely at ease and would send us regular picture updates. Would definitely recommend her! Paulina and Luis took amazing care of my rabbit, Snickers, while I was away for Christmas. They sent me pictures of Snickers while I was away, and when I returned, she was calm, clean and healthy! Amazing find for a last minute pet boarding, Paulina and Luis were both lovely and took great care of my rabbit! Couldn't be happier, thanks again! Paulina has been taking care of my African Grey parrot "Lipstick" several times, she's super flexible and i know she spent time with him playing everyday because they established a good communication, she sent photos and give the good food and keep him clean and entertained. I'm super happy about Paulina and Lipstick as well, he loves going there and it's so important to know your best mate is safe and having some fun! I warmly recommend Paulina! I am very happy with the service Paulina provided for my two pet Guinea Pigs. She was very efficient and it was a friendly environment for the Guinea Pigs. She made them feel comfortable and also provided us with pictures to make us feel at ease. I would highly recommend Paulina's service for small animals. My bunny was well looked after during Xmas, so I could enjoy my holiday; knowing that Edgar is in good hands. He had "free" time and I was updated on him from time to time. Also Paulina was very flexible towards my many last minute changes. Thank you. Paulina is the best pet boarding in London! Very friendly and great service! Left my bunny for 3 weeks holiday,when i cambe back my pet rabbit was really calm and really clean! Going on holiday again soon,and using her service again! Would recommend to anyone,as she is really caring and professional! Could not ask for better place for my belover bunny! Such a relief to know that someon else is taking care of her like i do! Our Pygmy Hedgehog Ted had a lovely holiday here and was very well looked after. I felt so happy knowing he was in safe hands while we were travelling. I would definitely use them again ðŸ˜Š Thanks so much! Paulina looked after my bunny Flapjack over Christmas. It was a last minute booking as my partner got a job over the festive break in another country. Paulina was so accomodating and lovely as it was the first time I had left my pet with someone else. She was clearly very experienced and knowledgeable about bunny care. She even messaged us pictures throughout our time away. I would highly recommend her. Paulina & Luis took care of Sherlock, my bunny, for several times and I couldn't be more happy! She sends pictures and let's me know how he is doing. She even took him to the vet one day when he wasn't eating very well and made sure he was back to his normal self when I picked him up. Wonderful people and very kind. Perfect people and place for my lovely rabbit! They take care of your pet as it was theirs. Higly recommended. Paulina and Luis took great care of our two lady fancy rats for two and a bit weeks over Christmas and New Year. We met Paulina when we dropped them off and had peace of mind that they were in good hands for our holiday. We would definitely recommend and use their pet sitting services again. I left my bunny with Paulina during the week of Christmas. On Christmas Eve I had a lovely photo of him with a Santa hat... When he came back he was very lively and in very good shape. Paulina was extremely professional looking after his eyes because they were a bit "wet" and inflamed. She texted me asking for instruction. I will certainly use them again. Paulina was looking after our bunny for a month. We were totally satisfied,our bunny got good care. She always sent us pictures so we knew our bunny is fine. Couldn't find even better babysitter! :) Will definitely ask her help if needed next time! Thanks Paulina!! Paulina and Luis were brilliant - they very kindly looked after our rabbit last minute over the Christmas period. We received regular updates about our pet, including photos, which was really reassuring. I would definitely recommend them to anyone looking for pet home boarding. Very happy with the service. Had photos sent to us while we were away. Flexible with drop off and pick up. My birds were well looked after, kept clean and happy. Will definitely use again. Wow! Best boarding ever. Not only was our bunny right at home, but he has come back super happy! He's well groomed and well looked after, and what was brilliant was that Paulina and Luis sent regular updates with how he was getting on. He's clearly had a fantastic time and we'll definitely be booking him in to stay Chez Paulina and Luis in the future! Thanks so much! I left my rabbit to Paulina for a couple of days. Paulina is warm and friendly. Moreover she's really flexible as I sent her a last minute request and she answered straightaway. I'm really glad I found her. She deeply loves animals and will take a good care of your pets. I definitely recommend her services. 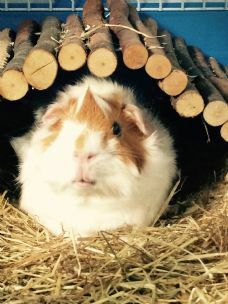 We are so grateful to have found Paulina's guinea pig boarding house for our guinea pig! She is an incredibly caring, knowledgeable and attentive host. This is a great place to bring your pet. It will be a lovely " home away from home" for them. It was the first time we have had to find somewhere for our rabbit to stay but Paulina looked after our lop eared rabbit Gandalf while we were away on holiday and I couldn't have asked for anything more. He was really well looked after, we were sent pictures of him exploring the flat and clearly settling in! Paulina and her son were so kind it was clear there wouldn't be any problems. I would highly recommend them and we will be coming back! I left my little rabbit Smarty with Paulina for a couple of weeks. She took great care of him, keeping me updated of his status regularly with pictures. I would highly recommend Paulina. Paulina and family offered a very caring, warm and friendly home from home for our two lops when we were away. They looked very relaxed and happy when we collected them, much more than other places they stayed previously. Paulina also seems very calm and relaxed with animals, but asks for details about their routines, eating and exercise so that it won't be a big change for them from their normal life. I have already booked them in for Christmas. Paulina took great care of our little parrot Charlie and was very flexible - we initially booked for two weeks then extended for another two. She seemed to genuinely like having him to stay and was not fazed by having him out of his cage, which some people find quite challenging. Will definitely use Paulina's parrot hotel again! Our rabbit Barney stayed here for over a week, it was very reassuring to know he was looked after by such a lovely caring place. They tailored his needs and feeding/playtime habits perfectly. They sent some lovely photos to us, so we could see all the fun he got up to. Thankyou again for caring so well for him! We will definitely use you again in the future! We needed a home for our hamster Minx during the summer holidays and I'm really glad that I found Paulina. She took such good care of him. He looked very happy and healthy when we collected him. It was the first time that we left him with a stranger. I will certainly ask Paulina again next year. She's very flexible with drop off and collecting times and makes sure to send you updates and pictures while you're away. Our three guinea pigs came back very calm and happy after their time with Paulina. I had received photos of them each day and cannot recommend Paulina's service more highly. Paulina and Luis are the best pet boarders in London. My bunny Nadia seemed to be very happy and relaxed at Paulina's house. Paulina put my mind at ease as she was updating me daily and sending photos of my bunny. I can highly recommend Paulina and her family. Excellent service. Very opened to the times of drop off and pick up of your pet that makes it very easy and approachable. We got update photos of our birdie. Thank you very much Pauline for looking after my 2 rabbits, choochee and Luna. They seem very happy and content, we are very glad we found such a person to look after our rabbits so well and we will definetly bring them again. Paulina and Luis have looked after our dwarf hamster twice now when we have gone on holiday, and each time have done a wonderful job, keeping in touch with us with photos and emails. We would highly recommend their pet care service. As first time bunny owners and first time in trusting my pets in another house, I was very worried. However, Paulina was so helpful and I was so happy whenever my phone buzzed with an update. Now that they are back home, I notice them loved so much and as a honest opinion, I would definitely trust Paulina again and recommend anyone who love their bunnies to her. Words cannot describe how overjoyed I am at the care given to my bunnies. I highly recommend this pet boarding place. Paulina is very attentive and made sure my rabbits got their daily veg unlike other places I have tried. She sent picture of them so I could see they were doing well. I will definitely use her again. Thank you! Paulina made the whole process incredibly stress free and calmed me by sending regular updates whilst I was away. I came back to a very happy bunny which is all I can ask for! Thank you!! I have left my Pets with Paulina and Luis twice now for over 3 weeks in total and I couldn't recommend them any more! They are really helpful and flexible about picking up and dropping off, updated me on my holidays about how my hamster Pedro was getting on and he seemed to have had a great time! recommended 100% by me and I will continue to leave him with them whenever I am away! We entrusted Paulina and Luis with the care of our pet hamster who is quite a little character for 7 days. It was our first experience of pet boarding and on arrival we were immediately at ease, very happy with her care and have booked her in for another longer holiday with them this summer. The boarding room is well maintained and they clearly care very much for all the pets that they look after. Paulina and Luis took care of our rabbit for 11 days. They were very attentive and sent us pictures every 2 days to let us know how she was doing. I will definitely use their services again! "Paulina is the best pet boarding service I could have ever hoped for. I left my 3 chinchillas with her. Very professional and would send me constant updates while on holiday. Definitely the best pet boarding ever I'll be back to her for sure! " Paulina and Luis are the best pet boarding service I could have ever hoped for. I left my two fancy rats with them and they are an absolute joy and would send me constant updates while on holiday. Soon leaving on holiday again and they are excited to see my two boys staying with them once more.